Skylake with less fuses blown and even PCI no ‘e’ slots! 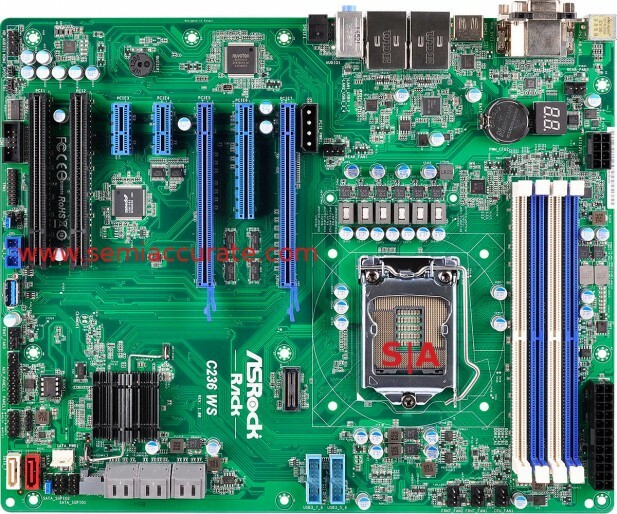 Asrock Rack has three new Skylake workstation boards out or at least one board in three sizes. In any case if you are looking for a Greenlow aka Skylake based Xeon E3-1200 v5 platform, your choices are now three greater. If you are wondering why anyone would want a Xeon E3-1200 v5 based machine over a Skylake one, the answer is simple, ECC. Intel rather arbitrarily fuses off needed features on their consumer lines to make you pay more but for consumer vs server it is not arbitrary. You can’t get a desktop aka non-Xeon anything with ECC so if you need that protection, shell out. On the up side you also are freed from all those annoying ultra-bright LEDs and color coördinated heat spreaders right out of an ’80s anime so it isn’t all bad. Back to Asrock Rack, they bring you three boards called the C236 WS, the C236M WS, and the C236 WSI. They are ATX, Micro ATX, and mini-ITX form factors which explains the suffix letters but not why they move so. All three are based on the Intel C236 chipset which means a socket 1151 without ECC turned off, dual channel DDR4/2133 support, eight SATA6 ports, four USB3s, and at least one PCIe3 16x slot. As you can see from the C236 WS above, sometimes more is a lot more. The C236 WS is the largest and it has a lot of PCIe3 slots, two 16x slots, one 8x slot, two 1x, and two PCI, yes PCI no ‘e’ slots. We can’t explain that last one in this day and age but some large customer appears to want it. This is an interesting setup because Skylake only has 16 lanes of PCIe3 off the CPU, the rest are off the chipset making it painful to use as we pointed out earlier. For the record when we first mentioned this glaring deficiency in the Skylake line, several Intel people told us off the record that it would never matter in the real world. Until Purley officially exists late next year, it matters. If you move down to the C236M WS you mostly lose PCIe slots but precious little else other than PCB area. 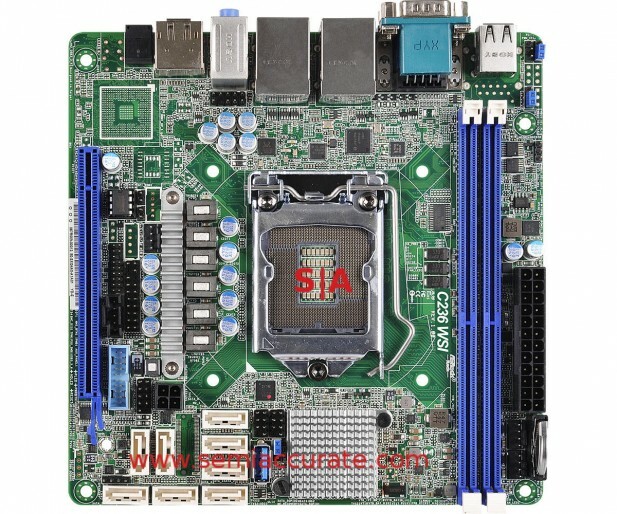 This board can be run as an 8x/8x or 16x/0x plus a 4x and an M.2 or a 1x but no PCI no ‘e’ this time. It seems pretty vanilla and if you are not using dual GPUs, you don’t really lose anything over its bigger brother. Next up is the odd one out, the C236 WSI micro-ITX workstation board. It sheds two DIMM slots for a total of two which may hinder any serious workstation duties. On the PCIe side it only has one 16x slot so if you need much more connectivity, time to get a bigger case. Other than that it is pretty much feature complete with the bigger boards, Asrock did a good job here.